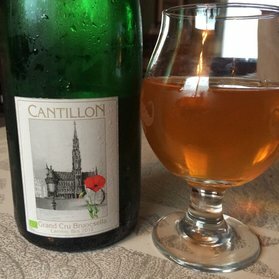 My first sour beer and one of my favorite styles! Flemish reds retain a lot of the character from the dark malts that give them their characteristic color. Traditional Belgian Flemish reds typically have some acetic acid that gives them an extra bite, but personally I prefer the style without acetic acid. This Flemish red used the fantastic Roeselare yeast and bacteria blend from Wyeast along with commercial sour beer dregs. After 18 months of aging with oak added, half the batch was aged on raspberries. The fruited version might be my favorite home brew yet! True lambic and gueuze is brewed in Belgium and spontaneously fermented using only yeast and bacteria that land in it during slow, overnight cooling. This beer was made in my kitchen with yeast from a package meant to make it taste kind of like lambic. Despite a foamy beginning because of all of the wheat in the recipe, this beer turned out pretty decent after ~14 months of aging. I also aged half on tart cherry juice to make a sort-of-Kriek. Dark, fruited sours have some kind of magic in them. The brettanomyces yeast takes compounds from the dark malts and turns them into these deep, complex flavor profiles that accent berries and stone fruits perfectly. This batch was full of dark malts and was fermented by Belgian Abbey yeast. Along with that yeast, I added the brett and lactic acid bacteria-rich dregs from great commercial sour beers and toasted oak. After aging for ~11 months, I split the batch and put half on boysenberries and the other on tart cherries. They're not quite done yet, but I've very excited about this batch! Update: These are now done and bottled, and they taste fantastic! I'm very happy with how they turned out! This tart farmhouse-style ale was fermented with a mix of saison yeast and brettanomyces before being dry-hopped with Nelson Sauvin and getting an entire bottle of California Riesling. The combo of the fruity, tart Riesling and the white-wine notes you get from Nelson Sauvin work very well together, and nicely complement the peppery/spicy esters and phenols that the saison yeast puts out. I really liked this half batch (other half is directly below). Sometimes beers are better in theory than in practice. I thought that the fruity and tart rhubarb would complement the floral notes that honey provides and the spicy, peppery esters and phenols from saison yeast. No dice. 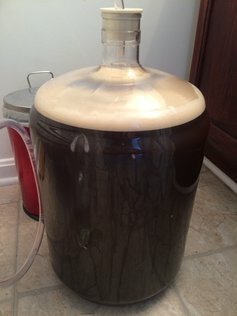 Everything clashes far more than I expected in this, my least favorite home brew. 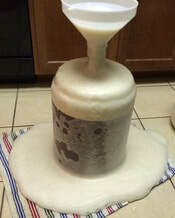 Spontaneous fermentation at home is difficult. It can be done well, but on small scales home brewers dump and much as they keep. So for this lambic-style beer, I borrowed the yeast and bacteria from arguably the best lambic/gueuze producer in the world, Cantillon. I grew up the live yeast dregs in a starter and fermented a lambic-style wort only with these bottle dregs. Its not quite done yet, by so far, its tasting absolutely great. 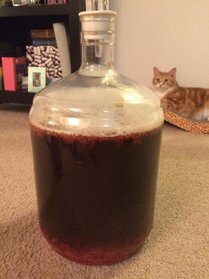 Update: I have now brewed Year 2 of the stolen Cantillon yeast "lambic" using some of the yeast cake from this beer and my culture of their bottle dregs. 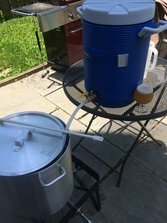 I'm planning on making my own version of Gueuze, which is a blend of 1, 2 and 3 year old lambic, so I'll need a third batch next year to complete it. Extended aging allows the yeast and bacteria in mixed-fermentation sour beers to clean up off-flavors and develop deep, complex flavor profiles. 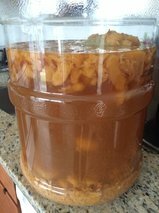 But if you just want a beer to be sour, you can do it in a couple of days! That's what I did for this split batch. The fast lactic acid came from pitching lactobacillus before the yeast. I then split the batch and layered flavors using lots of fruit and generous amounts of dry hops. One half was aged on nectarines from a local farmers market, and the other half got a mix of raspberries and blackberries. 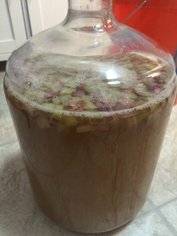 Interested in knowing more about sour/funky beers, how the pros make them, and how to make them at home? Here's some links to sites and resources I've found really helpful! Cover Photo: Barrels of spontaneously fermented lambic quietly aging at Brasserie Cantillon, Brussels, June 2015.